The courtyard of Palazzo Strozzi has lately lost its function of passageway. It has become a vital spot for cultural events taking place all the year round, thanks to the Strozzina Foundation. A new challenging trend to define its role, the urgent need to re- state cultural, economic and political values which seem, by now, unhinged. Thence its intriguing proposal: the courtyard becomes an agorà where to build up and share different viewpoints, inside a common cultural heritage, as privileged issues unknown to the anonymous social media. The court gets a catalyzer of confrontation, on April the 30th 2012 at Florence” Notte Bianca” (sleepless night). 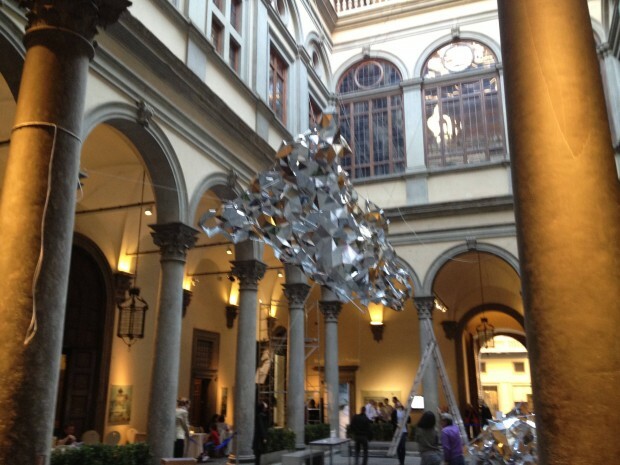 Palazzo Strozzi celebrates it with an installation “Aerial Boundaries” by Loris Cecchini, an artist from Milan living between the Siena countryside and Berlin. The work consists of large three-dimensional geometrical reflecting shapes, suspended on the courtyard. A game of light and shadow fragmenting architectural elements around. It is a dialogue between the reality and the image of it. The connection with Florentine neo-platonism, source of Renaissance and the real world is clear. The reference to the fragmentation of our times is patent, no need to disturb Modernism and its highest work Eliot’s Waste Land. The geometrical shapes, looking like floating clouds, capture the harmonious elegance of the courtyard to give back distorted, though intriguing, images. The visual perception of the court through them has completely changed. 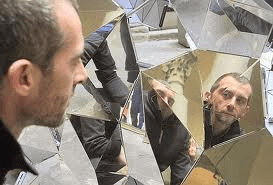 The aim of my work – Cecchini says – is questioning oneself, abandoning the customary certainties in search of more complex and deeper understanding. From there the installation will move on June the 30th to an open- air museum, the Fattoria di Celle. Look at the post written about it on tuscany holiday rent blog.